Boeing will use a Delta 2 7920-10 to launch the five Iridium satellites. Boeing manufactures Delta rockets in Huntington Beach, Calif., with final assembly in Pueblo, Colo. 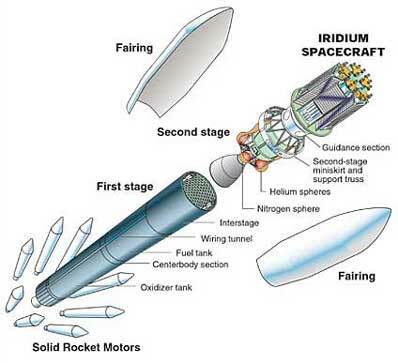 The 7920-10 two-stage launch vehicle has four major assemblies: the first stage, including main engine and nine strap-on solid propellant rocket motors; interstage; second stage and 10-foot diameter composite payload fairing. The Delta 2 is approximately 126 feet tall and eight feet wide. Manufactured by Rocketdyne, a division of Boeing, the RS-27A main engine operates on liquid oxygen and RP-1 (kerosene). The RS-27A has a sea-level thrust of 200,000 pounds. Each of the four Alliant Techsystems solid strap-on motors has a sea-level thrust of 100,270 pounds. The main engine and the four solid rocket motors deliver a total thrust of 483,000 pounds at liftoff. An Aerojet AJ10-118K engine powers the second stage and burns Aerozine-50 fuel and nitrogen tetroxide oxidizer. Ignited at altitude, the engine has a vacuum-rated thrust of 9,815 pounds. The Boeing family of launch vehicles is derived from the Delta family of rockets built and launched since 1960. In that time 289 Deltas have been launched. Delta 2 rockets can be configured as two- or three-stage vehicles depending on mission requirements. The latest version, the Delta 2 7925 model, can boost 3,965 pounds (1800 kg) to geosynchronous transfer orbit (GTO). Today, Boeing has a growing list of commercial customers, including Hughes Space and Communications International, Inc., Space Systems/Loral, and Motorola. To serve its commercial customers, Boeing has agreements with the U.S. Air Force and NASA for the use of two government-owned launch pads at Space Launch Complex 17, Cape Canaveral Air Station, Fla., and one pad at Space Launch Complex 2, Vandenberg Air Force Base, Calif.
Major subcontractors include: Alliant Techsystems, Magna, Utah, graphite epoxy motors for boost assist; Aerojet, Sacramento, Calif., second-stage engine; and L3 Communications Space & Navigation, Teterboro, N.J., Redundant Inertial Flight Control Assembly (RIFCA) provides course and attitude control.